Strange Hominin Fossils From China – A New Species? A new study of fossilised teeth and jaw fragments found in a cave back in 1976, suggests the possibility of an unknown species of human living in northern China between 120,000 and 60,000 years ago. A paper published in the American Journal of Physical Anthropology concludes that the teeth have similarities with Homo neanderthalensis and the much older hominid species H. erectus. The research was carried out by a team of scientists from Beijing’s Institute of Vertebrate Palaeontology and Palaeoanthropology in conjunction with anthropologists from the National Research Centre on Human Evolution (Burgos, Spain). The fossils represent the remains of four individuals and the teeth do not resemble those of modern humans. Instead, they possess a range of primitive and more derived features, this could indicate a new species, yet to be described or possibly a hybrid hominid, a result of interbreeding between two already described species. The fossils were found in a cave close to the village of Xujiayao, Yanggao County in Northern China. The site is approximately 120 miles west of Beijing. María Martinón-Torres (National Research Centre on Human Evolution), explained that the research team examined the size and shape of the tooth crowns and their associated root system, the groves, cusps and crests. These features were then compared to over five thousand fossil teeth representing nearly all the known hominin species. The features of teeth are diagnostic when it comes to determining species and phylogenetic relationships. 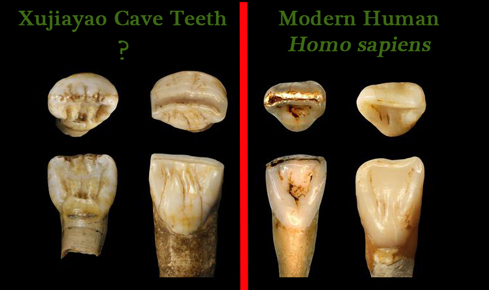 The Xujiayao cave teeth (left) are compared to a modern human (right). Although a number of palaeoanthropologists have challenged the team’s results and all agree that more fossil material from ancient Asian hominins is required so that a more complete picture can be built up, this study does raise the possibility that there may have been an as yet, unknown species of human living in northern China as recently as sixty thousand years ago. Given the size of Asia and its relative remoteness thanks to foreboding geological features such as the Ural mountains and the Himalayas, it is not surprising that isolated pockets of early hominins could have evolved distinct characteristics. Or indeed, given the harsh environment and tough lives of these ancient humans it is not entirely surprising that interbreeding did occur between closely related species that overlapped territories. Team members at Everything Dinosaur predict that more hominin fossils will be found in Asia that further complicate the relationships between the various recognised species. Back in 2012, Everything Dinosaur reported on a study of human fossil remains found in south China that could represent a new species of hominin. These ancient humans were nicknamed the “Red Deer People” and they lived much more recently than the Xujiayao hominins. The research was carried out by scientists from the University of New South Wales and one of the researchers involved in this earlier study, Darren Curnoe, supports the idea of the Xujiayao fossils being a separate species. He stated that although the sample was small, the unique characteristics of the teeth did suggest that a new species had been found. Most palaeoanthropologists accept that from the Middle to the early Late Pleistocene Epoch, a time interval that spans from about 340,000 years ago to 90,000 years ago, Neanderthals occupied Europe and western Asia. Anatomically modern humans were present in Africa, but the paucity of fossil material prevents scientists from describing the hominin populations of most of Asia. Furthermore, the evolutionary interaction between eastern populations of hominins and those from Europe and Africa remains poorly understood. The Xujiayao teeth sample expands the variability for early Late Pleistocene hominin fossils and also suggest that a primitive early human lineage may have survived into the Late Pleistocene in northern China. Children in Reception class at St Michael and St John’s R.C. school have been learning all about dinosaurs this term. With the enthusiastic help of teachers Mrs Collinge, Mrs Clarkson and teaching assistants Mrs Venguedasalon and Mrs Lambert the budding young palaeontologists have been designing their very own dinosaurs and creating lots of very colourful artwork. The children have been exploring some of the vocabulary associated with prehistoric animals, there was plenty of evidence of meat-eaters, plant-eaters and other terms related to animals, habitats and food chains. Colourful dinosaurs including a “Spikeosaurus”. The children had designed their own dinosaur and a number of very imaginative creations were on show, surrounding a large, red “Spikosaurus” with its green spotted tail. Reception class has thought hard about the sort of questions they would like answers to as they explored dinosaurs and part of the children’s display featured post-it notes with questions the children had written. Care had been taken with the use of capital letters and full stops and it was clear that phonics sounds had helped the pupils to write their questions down as they considered how to design their very own dinosaur. There were many examples around the classroom demonstrating how literacy aims had been woven into the prehistoric animal themed teaching activities. Numeracy and confidence with numbers had also been carefully considered as part of the scheme of work. Part of classroom had been dedicated to a dinosaur themed addition and subtraction area, with pictures of Triceratops, Apatosaurus and other dinosaurs being used to help the children familiarise themselves with terms associated with adding and taking away. Everything Dinosaur had visited the school in support of the term topic, conducting a morning of activities with Reception and Class Three. Both classrooms were covered in examples of the children’s work. Class Three had compiled an impressive timeline which explained key developments in the history of human civilisation. Our visit helped to reinforce learning as these Lower Key Stage 2 children explored rocks and fossils. One little boy in Class Three even brought in a lovely fossil of a fish and some of the Reception children showed us their dinosaur books. We had a great time helping the children learn about life in the past and how fossils form, the school is certainly a vibrant, dynamic learning environment. Children at Hambleton C of E Primary School had an exciting day learning all about dinosaurs and fossils as one of our dinosaur experts visited their school. Year 1 have been studying dinosaurs for their science topic this term and the budding young palaeontologists had prepared a list of questions. Answers were provided during the dinosaur workshop. Questions asked included how did the dinosaurs become extinct? What colour were dinosaurs? Which was the biggest dinosaur of all? The children wanted to know all about Tyrannosaurus rex, Finlay asked how long did T. rex live for? That’s an excellent question and one that was that not answered during the morning of dinosaur and fossil themed activities. Like most animals, few Tyrannosaurs made it into adulthood. Predation, disease, parasites, starvation and injuries would have all placed a heavy toll on a given population of these meat-eating, Theropods. However, if a T. rex did survive into adulthood, then we estimate that it might have lived for some thirty years or so. Calculating just how long a Tyrannosaurus rex lived is quite a tricky task, however, a number of studies have been published looking into the growth rates and potential life spans of the Dinosauria. We certainly had some amazing questions from the Year 1 children. The enthusiastic prehistoric animal fans in Reception class had a dinosaur day to coincide with Everything Dinosaur’s visit. Mrs Parkin and Mrs Bingham had prepared lots of themed activities and some of the children had brought in dinosaur toys from home. Whilst the Reception class waited for a “dinosaur egg” to hatch they set about building their very own prehistoric playground for the dinosaurs. Our expert was shown where the dinosaurs could hide in the cave and where the river was so that the dinosaurs could have a drink and go for a swim if they wanted to. It was great to see such imaginative, creative play. The children were certainly engaged with the topic. We explored some of the vocabulary associated with animals and what they ate. In addition, whilst building the dinosaur habitat, the children were learning about the resources that living things require to keep them alive. One of the favourite parts of the dinosaur workshop was when the children got the chance to engage in role play, reproducing behaviours and pretending to be huge, herbivores. A very busy morning with the Year 2 class at St Malachy’s R.C. Primary who have been studying dinosaurs and prehistoric animals. The children had been learning all about when the dinosaurs lived, where they lived and how they became extinct. Miss Butterfield and Mrs Parker had been teaching the children all about continents and countries and a most impressive map had been created which showed where in the world some dinosaurs lived. Can you spot a spelling mistake? We wonder if any of the children have spotted the mistake, we think this is the teacher’s very clever way of encouraging the children to be observant. As part of the ICT element of the curriculum for the spring term, the children had been making some dinosaur posters and learning how to copy and paste material from the internet. Some lovely examples of posters were on display on the classroom wall and outside in the corridor. They certainly brightened up the corridor. Our dinosaur expert set the class some challenges, one of which was to come up with some science posters based on the information provided. In addition, the children demonstrated their use of adjectives and we had some wonderful examples, especially when it came to describing the fossil teeth. To cater for the design/technology (DT) and art elements of the curriculum, teacher Miss Butterfield, aided by Mrs Parker (teaching assistant) had been helping the children to design and create different prehistoric animal models, including a super sculpture of a fearsome Velociraptor. The children had to think carefully about which materials to choose and they had been challenged to use different media to create their prehistoric animal pictures. We saw some lovely examples of artwork including a dinosaur called “Spike-0-saurus”, a very spiky dinosaur, hence his name. Lots of colourful prehistoric animals on display. So many different types of dinosaur model had been made that some had even been put on display outside in the corridor. It made our dinosaur expert feel very happy as he passed lots of models of Stegosaurs on his way to the classroom. The children compared parts of their bodies to the bodies of dinosaurs, some of the bones and casts that the children saw helped them to appreciate just how big some dinosaurs were. It looks like Class 2 are having fun learning all about palaeontologists and life in the past. Here is a quick video that showcases two of the new for 2015 prehistoric animal models from Papo. The video features the Young Apatosaurus replica, (dimensions confirmed as being 37cm long, 13cm high) and the excellent Pterosaur figure – a Tupuxuara. In this short, (43 second video), we also compare these two models to the enormous Papo Brachiosaurus dinosaur model that was introduced in the autumn of 2012. The Tupuxuara Pterosaur may be small but it is beautifully painted and the crest detail is superb. The Papo Brachiosaurus measures a whopping 40cm in length, the head is some 32cm high. We used this model to provide a scale to compare the two new additions to the Papo range. The Young Apatosaurus, in our view, represents a sub-adult, think of this replica as representing a teenage dinosaur. Both the Papo Tupuxuara and the Papo Young Apatosaurus models are expected to be in stock at Everything Dinosaur early March, although they could arrive a little earlier. Check out this web log and Everything Dinosaur’s social media pages for updates. Watch out, a Pterosaur is coming this way.